The Auberge sur la Montagne offers spacious accommodation for up to 21 people. We have 5 large ensuite guest bedrooms in the main chalet, and accommodation for 6 additional people in the 3 rooms of the Garden Wing (all with ensuite bathrooms). We have family rooms which can sleep 4 or 5, large twin/doubles that can sleep 2 or 3, and smaller double/twin rooms. We have separate dining and sitting rooms, a fully stocked bar with roaring log fire, a TV/Games room, and ski room with boot dryers. We offer an in-house ski rental service. Our sun trap south facing sun terrace and garden are glorious on sunny days, and we have an outdoor hot tub and sauna for use in winter and summer. We cook all the meals ourselves, and take a pride in serving a variety of local and international dishes, including a vegetarian option. The Auberge sur la Montagne and the other chalets and apartments in the collection are equally well-placed to ski Sainte Foy, Val d'lsere, Tignes or Les Arcs in winter as it is to explore some of the most stunning mountain scenery in the French Alps in summer. The boutique catered chalet featuring contemporary design in a rustic setting, offers 5 comfortable ensuite bedrooms, a separate 3 bedroom apartment, spacious lounge/bar & dining room, a friendly atmosphere and superb home cooking, including vegetarian options, in the traditional village of La Thuile just 3kms from Sainte Foy resort. We have a sun trap south - facing terrace and outdoor jacuzzi and sauna in the garden for relaxing winter or summer. The other self-catered chalets and apartments are located in Sainte Foy chef-lieu and surrounding villages, and are all served by the free bus service to Sainte Foy resort. Winter at the Auberge sur la Montagne: Our position in the middle of everywhere gives you the most fantastic choice of downhill winter sports! The world famous Val d'Isere - Tignes circuit is an 8 minute drive away and Les Arcs is 10 minutes, whilst La Rosiere with it's links to Italy is 25 minutes away. The off-piste powder paradise of Sainte Foy is a 5 minute drive, and there is a regular bus service. It's uncrowded pistes also make it ideal for children and beginners. Non-skiers are well-catered for with facilities for cross country skiing, dog sledding, ice climbing, ice fishing, ice skating and swimming. Or take a leisurely stroll round the shops and weekly markets at one of the nearby resorts. Summer at the Auberge sur la Montagne : We're right on the edge of the Vanoise National Park and have walking and hiking routes written out and ready to give you! Sensational mountain scenery. Some of the best mountain bike and road cycling routes in the world on our doorstep, as well as a multitude of other sports e.g. glacier skiing, white water rafting, golf, horse riding, swimming, tennis, fishing, parapenting and rock climbing. Gentler pursuits include the Baroque church trail, local vineyards, concerts and local fetes. Location: We are in one of the most easterly and most beautiful parts of the French Alps, nestled on the side of the mountain just off the D902 between Bourg St Maurice and Val d'Isere. Our nearest airports, Chambery, Grenoble, Lyon and Geneva are about 2-3 hours drive away. In winter there is a direct Eurostar service from Waterloo to our nearest station at Bourg St Maurice, about 15 min drive away. With pre-booking we have a minibus available for local transport or airport transfers at a reasonable charge. The Auberge sur la Montagne has stunning views of the surrounding mountains and is situated in a peaceful corner surrounded by fields, yet easily accessible to the mountain resorts of Val d’Isère, Tignes, Les Arcs and La Rosière as well as Sainte Foy Tarentaise. It boasts a state-of-the-art outdoor hot-tub and sauna. During a recent trip to Alps for motorcycle tour incorporating advance riding tuition we stayed at Auberge Sur Montagne. The accommodation was excellent, clean and well maintained. The staff were friendly and most helpful. Catering was 5 Star. Would strongly recommend to anyone wishing to stay in this region of France! We are nestled on the side of the mountain at 1300 metres altitude between Bourg St. Maurice and Val d’Isère in the Tarentaise valley in the French Alps. We are ideally placed for winter ski holidays in the nearby resorts of Sainte Foy Tarentaise, Val d'Isere, Tignes, Les Arcs and La Rosiere and for walking holidays, cycling holidays and mountain biking in the summer. The stunning flora and fauna of the Vanoise National Park is just a short drive away. We are a comfortable 10-hour drive from the Channel. If you prefer to fly, Geneva and Lyon airports are 3 hours away, Grenoble 2½ hours and Chambery 2 hours. All airports are served by one of the low cost airlines. Eurostar runs direct services from Waterloo or Ashford to Bourg St Maurice during the winter. 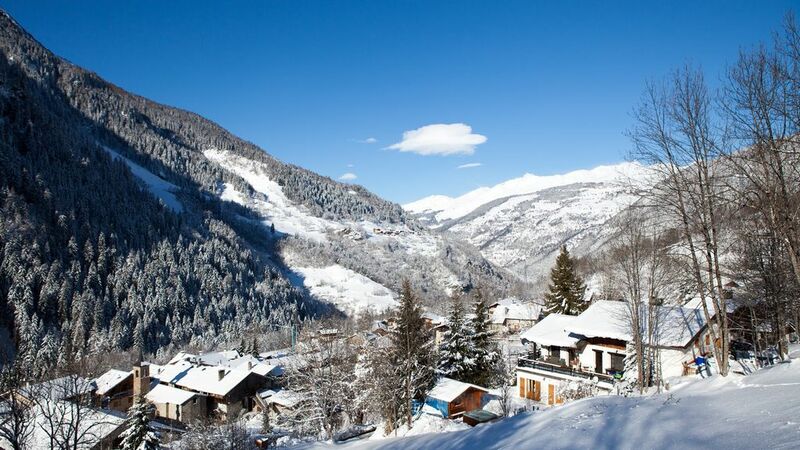 Ski: Sainte Foy offers one of the best value lift passes in the French Alps. You can also ski for a day at each of Val d'Isere, Tignes, Les Arcs and La Rosiere at half price. Children under 7 ski free at Sainte Foy and are well looked after by the friendly local ski school and crèche (4 and over). The under 3's will be happy spending the day with our fully trained nanny leaving you free to enjoy your time on the slopes. Prices are per room based on 2 adults sharing an en suite room on a half board basis for. Discounts for shared bathroom, 3+ occupancy, children, and single person occupancy. Part-week stays considered in off-peak periods subject to availability. Nos tarifs sont par chambre (2 personnes) en demi-pension (obligatoire) par semaine. Tarifs réduits pour les enfants selon leurs ages.